This entry was posted in Breaking ground, Varieties and tagged black prince, moonglow, seeds, tomatoes. Look at you, you have sprouts. I won’t be planting my seeds until March since I can’t plant until the end of May. Sounds like we’re about three months off of one another’s climate. 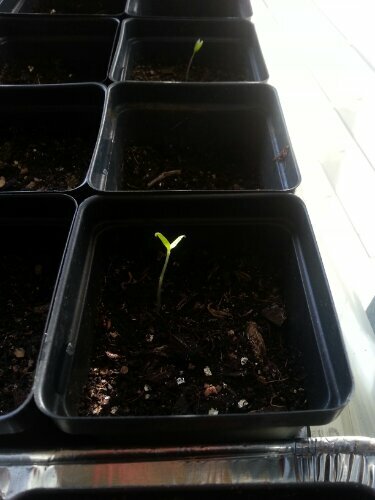 My tomatoes can sometimes go out March 1st, safer toward the 15th. I wish I could get mine in the ground earlier but frost is the big problem. Then we can get frost late September so the growing season is very short. That is short! Do you get them into decent pots in the spring before the last frost date? I don’t have the room for real pots in sunny windows, or else I might start even earlier to have bigger plants before planting out. We don’t get frost until November, maybe December, but tomatoes don’t last through July usually for the heat. Sometimes I’m mindful enough to put up shade cloth and extra mulch so they don’t fry. If I can keep them alive long enough, some set a second harvest for October, but it’s not very guaranteed. Black Prince is a winner:-) We don’t even start our tomatoes until March..oh, do share lots of pictures of your vegetables. Really getting tired of the below zero weather! These babies get to go outside in March here. Do yours get to stay out through the summer? Interesting! It’s the largest tomato I’ve found to produce decently in our heat.